It’s amazing what a little time can do to your perspective of certain things. When I founded Co-Optimus a game like Sesame Street: Once Upon a Monster wouldn’t have even been on my radar - I was a man that cared more about the next Halo game than I did about the next casual or kids title. But now as the father of a two and a half year old girl, Once Upon a Monster instantly appealed to me as a way to entertain her and enjoy something with her, without having to watch another episode of The Fresh Beat Band. Once Upon a Monster follows Cookie Monster and Elmo through a book of the same name. Each chapter in the book is a smaller themed story set in the world of Sesame Street. Developed by Double Fine, the game utilizes colorful graphics, familiar characters, and plenty of activities for the Kinect to educate and entertain kids..and adults. For me the graphics stood out immediately as impressive, the 3D rendered muppets are gorgeous with fur that looks soft and plush. At first glance you’d think you were watching a video from the TV show, but there's no puppeteering involved here. 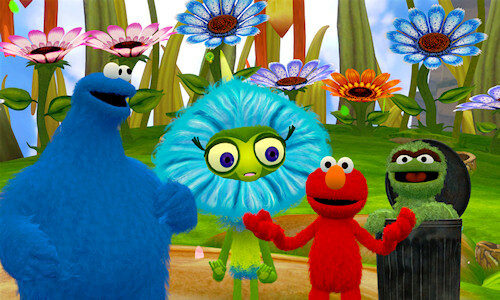 The characters look like a muppet should and they all sound appropriate to their character...yes...even Elmo’s annoyingly squeaky voice. The great thing about Once Upon a Monster is the entire game is designed around co-op play. Every activity in the game has two monsters present to complete it. If only one person is playing the AI takes over for the other, but a second player can drop in at any time simply by jumping into the frame and waving or starting the activity. If you have a toddler, you know they aren’t exactly the type to sit or stand in one place at any time. Luckily Once Upon a Monster does a great job of picking up your little tazmanian devil as he or she zings around your living room while playing the game. My daughter dropped in and out of the game dozens of times and it didn’t skip a beat. She crossed my field of a view, got too close to the TV, and even switched sides with me throughout activities. Each time the game adjusted or made some sort of audible mention to help us - Cookie Monster or Elmo will say something like - "I'm having a hard time seeing you, please move back." I tried using a blanket to setup some stage blocking for my daughter, it worked for a little, but eventually she just got too involved with the game to stand in a 3 foot area. Page created in 0.3122 seconds.